Comment: On her blog, educator Carolyn Brown suggests inviting your congregation to explore sheer silence, noting “that even near-silence can be either very comforting or rather scary.” (http://worshipingwithchildren.blogspot.com/2013/06/year-c-proper-7-12th-sunday-in-ordinary.html) Silence invokes different feelings in different circumstances. I wonder if Elijah was comforted or terrified by the sound of sheer silence. The Quiet Book explores different kinds of quiet that occur in different situations including “last one to get picked up from school quiet” and “top of the roller coaster quiet.” Using this text and story, wonder with the children of your church about what it feels like to experience different kinds of silence and what Elijah might have felt in the silence that followed such loud experiences. Comment: Pamela Eisenbaum suggests that Paul’s intention is the building of family and that Galatians 3:28 is “[encapsulating] the message that people who are different can, if they so choose, come to understand themselves as meaningfully related to each other, committed to their well being, and part of a shared world.” (http://www.crosscurrents.org/eisenbaum.htm) One Family is a counting book that beautifully illustrates this idea. As the numbers increase, a wide variety of people are represented while always highlighted as being one family. 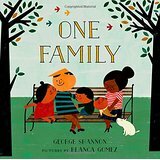 Using this text and story, explore what it means for people to be so different and still belong to one another and God. Comment: “We do not know how the Gerasene man fell into his pitiful state, but he is not unlike homeless people today… [who] are ‘unclean’ and unwelcome in most communities… Every city has its Gerasenes. The Gerasenes are our neighbors.” (Feasting on the Word, Year C, Volume 3, pp 168 & 170) With these words, Elaine A. Heath challenges us to share the compassion of Christ with those in our community whom we often label as unclean. 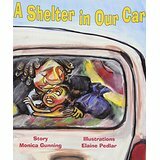 Likewise, A Shelter in Our Car invites readers into the emotional, often fear-filled world of a young girl experiencing homelessness. May your congregation hear this text and story as a call to share the compassion of Christ with neighbors experiencing homelessness. The Lectionary Links this week are written by regular contributor and Union Presbyterian Seminary alumna Noell Rathbun-Cook. Lectionary Links: Sunday, June 19, 2016 by Storypath is licensed under a Creative Commons Attribution-NonCommercial 4.0 International License.